The roof coating is the topmost layer of any roofing system and is subjected to damage from sunlight, rain, hail, and any other harmful weather conditions. A roof coating is a fully adhered fluid applied membrane. Being elastic, the coating stretches and shrinks back to original shape with ease. A coating could be about 3 mils thin, or it could be over 40 mils thick. When installed properly, roof coatings can fix leaks on roof. 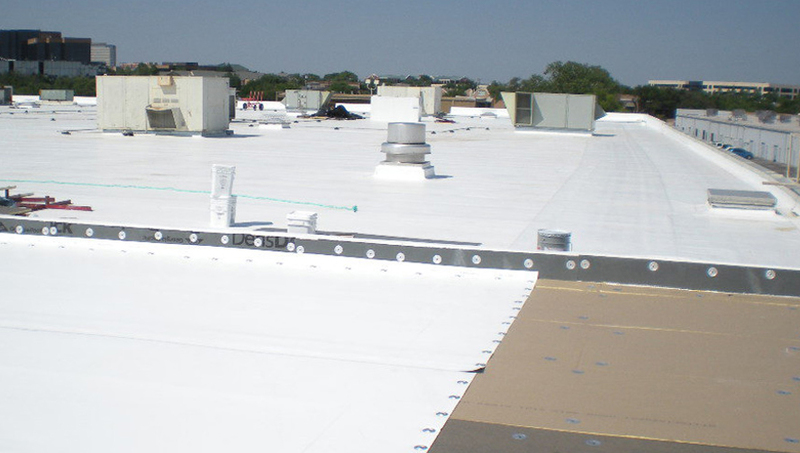 Roof coatings involve various processes and applications. As a commercial property owner, it is tough to understand the various aspects of coatings. One should hire qualified professionals to help make the best decision in incorporating roof coatings on a property. SRCG is well-equipped to provide all the options required for the roof coating work. Some roof coating applications require adding a tint for aesthetic reasons; for most commercial buildings a white coating is used for the added energy savings. SRCG evaluates all the aspects for the flawless application of coatings. Coating your roof can be challenging; we are here to make it easier for you. We have an expertise in protecting various properties with an effective coating to prevent damage caused by extremes of weather. For all types of roof coating requirements, contact SRCG roofing systems now! Coating systems, whether for your roof or wall, offer a cost-effective method of maintaining an existing asset as and when needed. Appropriate coatings can protect and prolong the life of your roofing system. SRCG has the capability and the required resources to install warranted coating systems for almost all applications. Liquid Applied or Elastomeric wall coating systems are a great way to protect walls by making them weatherproof. We provide wall coatings that are energy-efficient, visually attractive, yet cost-effective. We use Fluid Applied wall coatings that are available in various colors and textures. These coatings provide a weatherproof shield to the walls. SRCG provides high performance coating systems that are essential to implement in commercial structures. Such coatings are easy to clean. Coatings required for interior usage include restaurant floors, day care centers, commercial garages, restrooms, laboratories and so on. Primarily, coatings are used to provide a protective layer over the concrete or wooden surface.